Brigitte Nielsen announced this week that she’s pregnant at 54. 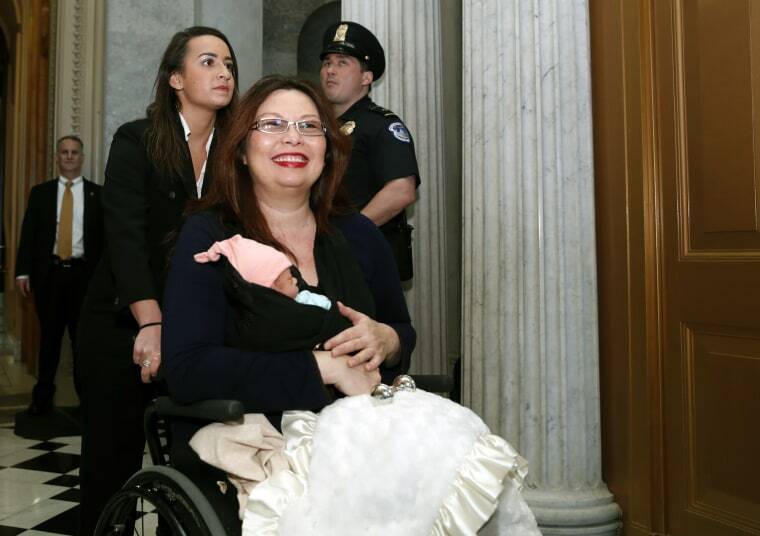 Senator Tammy Duckworth recently gave birth to daughter Maile a month after she turned 50. Janet Jackson also had a child at 50. So did singer/songwriter Sophie B. Hawkins. Supermodel Iman had daughter Alexandria when she was 48. Plenty of data exists to support this observation. According to a 2017 report from the CDC, birth rates declined for women aged 15–39 from 2016 to 2017 but rose for women aged 40–44. In fact, women in their early 40s were the only group with higher birth rates in 2017, up 2 percent from the year. Then again, women have always had what was once referred to as “change of life babies,” or babies born during perimenopause. Though conceiving a child near or at 50 isn’t as easy as is when you are half that age, it’s certainly possible. A 2015 study following 49 “essentially healthy” women through 59 clinical pregnancies (there were some multiples) determined the obvious; though there were some first trimester miscarriages, the majority of the “appropriately screened” women — meaning women who receive the health care they need — were able deliver their children successfully, but not without an increased risk of pre-eclampsia and gestational diabetes. The conclusion stated a “significant majority” of pregnant women in this age group should “expect” a cesarean delivery (C-section). Getting pregnant without intervention, however, can be an issue. “The chances of a women conceiving at 50 is not well studied. However, without any reproductive assistance, the chance of spontaneous conception is likely less than 1 percent,” says Scott A. Shainker, DO at Beth Israel Deaconess Medical Center in Boston, MA. Not exactly betting odds. Some scientists are hard at work to change all that. According to an article in New Scientist, a Greek fertility clinic is a trying to help menopausal women get pregnant using their own eggs by injecting their own platelet-rich plasma directly into their ovaries and uterus, with the goal of repairing their reproductive systems. Until unconventional methods like this become conventional, Minkin says if a healthy woman in this age range wants to get pregnant but is unable to make eggs on her own, she could be a good candidate to have a donor egg fertilized with sperm in vitro, and have the embryo implanted into her uterus. Rhonda Collins, the Oakland, CA-based co-founder and CEO of an online toy recycling community called Toy-cycle, had twins at the age of 48 via IVF using donor eggs from the Czech Republic. She says her doctor wasn’t particularly alarmist about her pregnancy: “My ob-gyn did not treat me differently. I live in a major urban center, so I think older moms are more common than perhaps smaller towns or rural areas,” she recalls. It can also be more challenging to maintain your health while pregnant the closer you get to 50. “The chance of becoming hypertensive and diabetic do increase with age, and these potential health issues become magnified with pregnancy,” says Minkin. “During pregnancy, the heart has to work 50 percent harder than in the non-pregnant state — our circulating fluid volume goes up by a full 50 percent. So, if someone has marginal heart function in the non-pregnant state, she should not put the added stress of the pregnancy on it,” she advises. With donor eggs the age-related genetics are of the donor — so that if a 45-year old woman is carrying an egg from a woman aged 30, the risk of Down syndrome is that of the 30-year old. And according to the American Heart Association, the increased risk of heart attack and stroke doesn’t end once you deliver. Compared to younger women, pregnancies at age 40 and older increased the risk of later strokes and heart attacks by a percentage point or more. Collins’ delivery wasn’t without complications. “I was all ready for labor — music, overnight bag, snacks, the whole thing. But with the development of pre-eclampsia, I was taken in for an urgent C-section that same day. I didn’t get to lie-in with my daughters as I had planned — still an emotional loss for me. They were sent to the nursery and then the NICU and I saw them 24 hours later when I got off the dreaded mag bag and could stand up again,” she recalls. If you plan on pregnancy over 40, Minkin recommends egg freezing (though there’s no guarantee those eggs will result in a healthy delivery) and staying as healthy as you can. “Smoking accelerates menopause and decreases fertility by about 2 years and keep as close to your ideal body weight as possible,” she says.